As usual, I`ve been falling behind on this blog entry. Therefore, I will have to focus this write-up on the race itself and not too much of the trip as a whole. Overall though, it was a great trip and for those who were wondering, Albania is an interesting county. I will definitely consider returning if I am in that part of the world again. It is very affordable, pretty easy to get around, has friendly people, and at least in the area where we were, was well set up for tourists. Sonja and I flew from Seattle via Atlanta and Milan in a 20+ hour flight arriving in the afternoon on Sept 8. I never sleep well on the plane, so could hardly stay up for dinner. Over the next two days, I got to meet the rest of the Canadian team (there were a total of 6 men and 4 woman), got a few easy runs in, visited the race course, and checked out the capital, Tirana, for a few hours. The night before the race, there was an opening ceremony for the 30 or so counties in attendance complete with a few speeches and cultural show. It was great to get away from normal life for a few days. When race day rolled around, the weather forecast called for high temperatures (33 degrees). This worried me somewhat coming from temperate Victoria. This year, particularly, I don`t think I ever ran in anything warmer than 25 degrees. 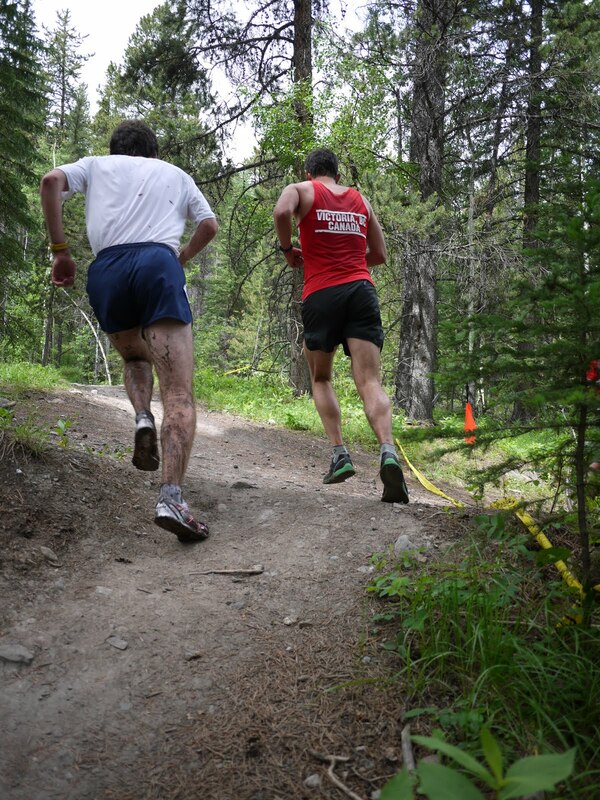 To make things even worse, much of the course was exposed on dirt roads and the seniors men's race started at 12pm. I had the feeling that it might be a rough day. We arrived a couple hours before the men's race started and just as the junior women were finishing their race. I was envious of them only having to do a single lap of the course since we had to do 3. Soon, the junior men were off and it was a furious start with several guys going down and nearly getting trampled. At 11am, the senior woman`s race started, with 4 our Canadian teammates competing (Laura Estey, Melissa Ross, Kathryn Waslen, and Sonja Yli-Kahila). That race was won by American Kasie Enman in 40:39, with Melissa top Canadian in 34th place, Sonja was the 2nd Canadian in 48th place. Finally, it was our turn, after a bit of chaos on the start line as all the teams were checked in, the field took off. I knew it was going to be extremely competitive since it was the deepest field I have ever competed in. My strategy, especially since it was hot, was to go out steady on the first lap and then try to make up positions on the 2nd and 3rd laps. 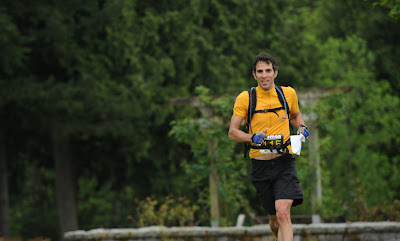 I held to my strategy, and was about 75% of the way back in the field after the first km or so. I was feeling average to start with and I hoped to be able to build into the race and finish strong. Things got bunched up as we moved from the road to single track, but I didn`t let it worry me too much - there would be plenty of time to make up positions if I had the wheels later on. The climb now started in earnest and while I ran all of the first part, as it steepened towards the top (topping out at a 40% grade) I decided to power hike. Normally, I prefer to run as much as possible, but this time around I decided to try a new strategy especially given the heat. It seemed to work pretty well, as I was able to power hike past a couple of guys who were try to run. I was hot, but I was not feeling it too bad at this point, and fortunately, water bottles were being passed out about every km along the course - I drank a bit each time, but mostly used it to cool my head and body which definitely helped. I reached the summit of the hill and started the decent. The first part of the downhill was the best part of the course for me, being relatively technical and each lap I made up time on this section. Unfortunately, it was too short and didn`t last more than a minute or so. After that, it was back onto dirt road, and it was soon after that I started to really feel the heat from the intense sun. 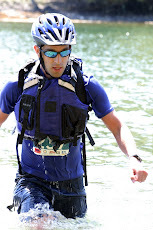 It was quickly draining my energy and I soon started to realize that this race was going to be about trying to keep my pace and position rather than trying to increase it. Between roads, there were a couple of steep loose little sections that added a bit of flavour to the course, but most of the downhill section was exposed dirt road. Part way down, I passed James Gosselin, who was one of the favorite Canadians in attendance. He looked OK, but I figured he must of had to pull out for some reason (turned out it was his back). It took me just over 20 minute for the first lap and I started up again, hoping that getting back into the shade (much of the climb was in thankfully not exposed) would revive me. It helped somewhat, but the sun had already done some damage and I just couldn`t push as hard as normal. I think I may have passed one of two guys on the climb despite the fact that I was not moving fast, but also got passed by one guy. I also picked up another position on the decent, but once back on the road, it felt as though the sun had doubled in intensity. Facing one more lap was quite daunting at this point since I was really suffering from the heat. My pace had slowed by close to 2 minutes on the 2nd lap. Luckily, as slow as I was going, I wasn`t getting passed and had actually made up a few positions. I really didn`t want to go up again, but never considered pulling out. 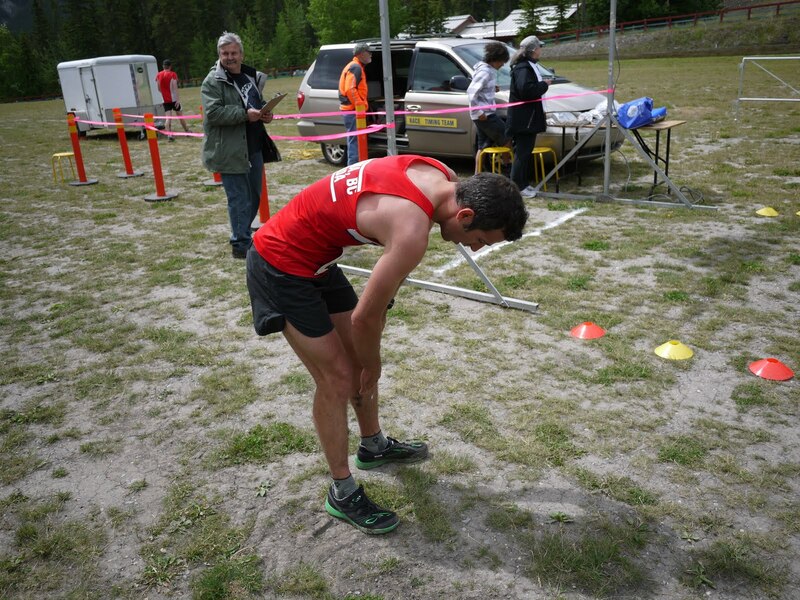 I`ve yet to DNF in a race and I wan`t about to start at a world championships! I puttered my way up the climb - hiking much more than I would have liked. The one solace was the those around me didn`t seem to be moving any faster. The downhill was still fun and I managed to pick up two more positions. I suffered all the way to the end, but managed to keep steady against the field, producing a mediocre surge to the finish to in 68th place in 1:05:08. I`m don`t think I`ve ever been so happy to finish a race! I was the last Canadian in, but turned out not to be in the worst condition. Fellow Victorian, Kris Swanson, went out hard and was in solid position (around 25th) for the first two laps, but then got hit by the heat on the last lap and suffered from heat exhaustion, fading badly (still finishing ahead of me though). Later that day, he had to be hospitalized, but fortunately recovered well. 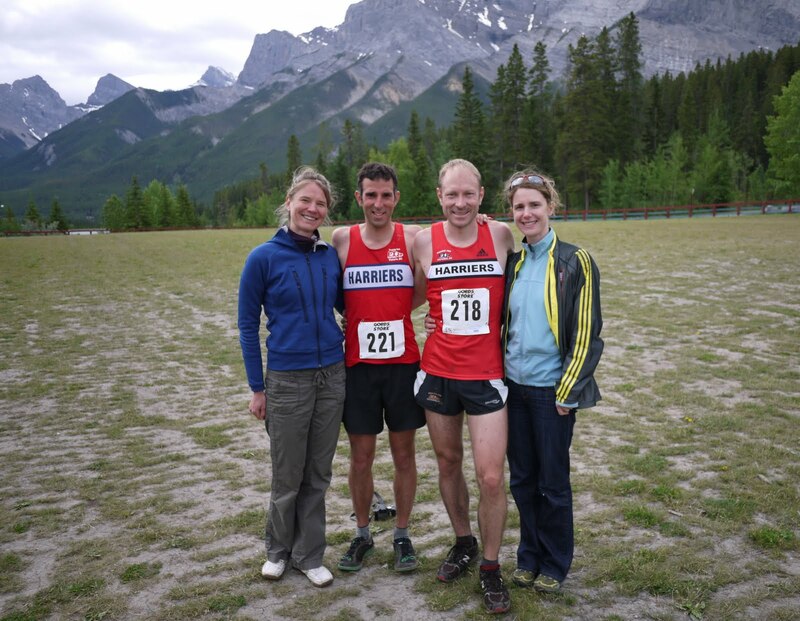 Adrain Lambert was the top Canadian in 37th place, with Paul Chafe and Mark Vollmer coming in 45th and 46th respectively. Team Canada placed 11th out of 17 teams. The race was won by Max King from the USA in 52:06, passing some quick starting Ugandan`s. This ranks ranks down there as one of my worst races, but I feel it was almost exclusively due to the heat and not because of my lack of training or conditioning. I feel luckily to be able to participate and represent Canada. A huge thanks goes to Prairie Inn Harriers for their financial support in getting to Albania and to Adrian and his family for making it possible to have a Canadian team at all. A marathon wasn't previously on the menu for this summer especially just 3 weeks before the world mountain running champs. However, I did have the thought in the back of my mind that it would be nice to do the Boston marathon next year. As most runners know, you need to be able to run a qualifying time based on your age and gender to be eligible to register for Boston. Although I didn't expect that running a qualifying time would be a huge challenge for me, I still had to actually run that time. Due to huge demand last year, the race organizers at Boston have instituted rolling registration dates starting with those individuals who had a qualifying time 20 min or faster than the minimum qualifying time. The first registration is Sept 12 and then two days later, the next group with times 10 min to 20 min below qualifying time are allowed to register. The same process occurs for those 5 min under and those just meeting qualifying time until all the spots are filled up. Therefore, to be able to register for Boston, I needed to qualify at a marathon before Sept 12. Since I had left it so late, this didn't leave too many options for me and Edmonton was pretty much it. It was to be a quick trip, leaving Saturday, racing Sunday and returning to Victoria that evening. The flight was quick, but between the airport shuttle and public transit, it really took a long time to get to the motel I booked near the start/finish. Since I am still a kid in some ways, I also took the time that evening to check out the water park at the West Edmonton Mall. There they have some pretty extreme water slides including one with a vertical loop. It was so fast, I didn't really know what was happening and then all the sudden I found myself spit out at the end. I hope I'll still be doing things like that when I'm 70.
had a small breakfast of yogurt, fruit, and a half muffin and walked over to the start line chatting with a couple other runner also doing the race. Since it wasn't a goal race for me, the nerves were not too worked up. All I needed to do was get a decent time (under 2:55) to make sure I could register in the first slot at Boston. And in a worse case situation where I didn't even make that time, most likely I would be able to register if I ran under 3:05. I knew that I might suffer a fair amount because I just hadn't been doing this kind of distance and especially not on the leg shattering road, but I was very confident that I could get the job done. On the start line chatting with with a few of the other top seeds, I found out there was one Kenyan, Jacob Mengich, who was the absolute favourite with boasting a PB of 2:13:31 - unless he cracked and pulled out, no one would touch him. A couple of the other runners mentioned wanting to run times in the 2:30's. If I was really racing and trained properly, that is where I would like to be. In any case, I planned on running 4 min km and least for the first 20k. This would put me in the under 2:50 range, but also should be a pace that was pretty comfortable for me. After that point, I could also ease back a bit if it felt like I was really going to suffer. Unlike most races I have done recently, the start of the race was quite measured - everyone knew they were in for the long haul. I soon found myself on my own behind both the lead pack and a chase group - it was looking to be a lonely day out there. Around 8k in, however, I noticed that the first woman was just a few metres back. I decided to drop back and chat for a bit to see what time she was planning to run. It turned out that it was Ellie Greenwood, someone I knew about, but had not met. Ellie is becoming a bit of a legend in the ultra scene over the last couple of years racking up a huge list of wins and course records (Western States 2011, 100k championships, Chuckanut 50k among many others). These are some pretty impressive credentials. She said she was going for a sub 2:50 finish and since this coincided with what I was planning to run it make sense to run together. If I could help her pull off a few more seconds with a pacing assist and still get the goal I wanted for the race it seemed like a win win. Also, running with someone makes a marathon go just a little easier. The next 15k or so went by pretty quickly with a steady pace average of just under 4min. Halfway passed in 1:23:37, a little ahead of schedule, but not bad. Things were still feeling pretty fresh and we chugged along. In the next few kilometers we reeled in 4 or so guys who went out a bit hard. If you can just run an even split in the marathon, inevitably some people will come back to you. Our pace continued to be on track, but it was starting to get hot (it would eventually get 30 degrees out later in the day). I started grabbing two cups at a time at the aid stations, but it was still a on minimal side in terms of hydration. Because I wasn't running all out, it wasn't a big factor, but it could have been. Since I was also concentrating so hard on getting the Gatorade and water, I managed to miss the gels that were being handed out. Since I had consumed the two items (a gel and shot blocks) by the halfway mark, there was still a long way to go with only a few calories coming in. Luckily, I was OK due to the "comfortable" pace I was running, but it is something to note for sure for the next real marathon. Our conversation slowly would down as the race continued and was replaced by a few words here and there. At a certain point, the job just needs to get done and there is no extra energy left for chatting. About 35k in, I could officially say that I was ready to be done - I wasn't in extreme discomfort and could still hold the pace with out huge effort, but the legs were starting to hurt and the kilometers seems to be coming at about half the speed that they were at the beginning of the race. It was obvious that Ellie was starting to hurt and was having to really dig in to maintain the pace, but other than slowing slightly on a gradual hill, was able to keep the pace. Ever so slowly the final kilometers ticked passed, 5, 4, 3, 2, and finally we were on the final kilometer. Ellie must of felt the finish was close at hand so pick it up strongly pushing right to a finish with a 4:18 for the final 1.2 km and breaking the tape just ahead of me for the win and a PB. While I certainly had more in the tank, I was still more than relieved to be finished. The legs hurt quite a bit and I spent the rest of the day doing a bit of post marathon shuffle, but fortunately recovered quickly after that. Considering my lack of specific training, I was satisfied with the race and result. This was only my 2nd marathon (Victoria 2006) and this time I was able to do 5 min faster with less specific training and much less effort and suffering. Now it is time to put in the proper training and pull together a marathon that is more comparable to my overall fitness level. This may be Boston, but I have yet to formulate my 2012 plan. I heard about this charity event though facebook and it peaked my interest. Not only does the money raised go to some good causes, but it also served an enticing challenge for me. I've always wondered how many summits I could do in a row - the most I'd ever done before was 4 (two from from the front and two from the back). This was the perfect opportunity to test my mettle. The event challenged participants to see how many summits they could do in 12 hours (8am-8pm). To prep, I packed a whole large duffel with food and drink: bagels, sandwiches, jujubes, hard boiled eggs, potato chips, steamed potatoes, bars, gels, carrots, water, Gatorade, etc. I basically didn't know what I would feel like to so I came prepared. I also brought another bag with extra changes of clothes and shoes. Unfortunately, when I got up in the morning to head out to the mountain, it was raining and looked like it had been all night. Descending on Mt. Finlayson is not fun when it is wet as it is quite technical. I came very close to heading back to bed for a few hours to see if it would dry up, but I decided to go for it anyway. If it was totally miserable, I could always just do a few summits and then head home, but if I didn't go for the 8am start I wouldn't have the chance to go for the full 12 hours. I arrived with a little spare time and signed up and got my number. It was still raining. 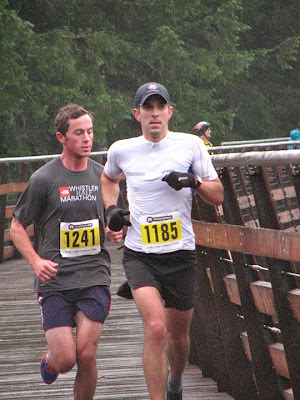 Two other runners I knew were also there: Hayden Earle and Rob Goetze so we started out together just after 8am. Since the plan was to go for 12 hours, I knew that being conservative was extremely important. If it didn't feel ridiculously easy to start with then I was going too fast. The first climb took about 26 min and the first descent about 19 min for a total of 45 min. I was soaked within a half an hour and going down the wet rocks wasn't too fun, but the shoes I used fortunately had pretty good traction. Throughout the day, I didn't take exact splits for my climbs since I spent some time eating, drinking, changing socks, etc. and the top and the bottom and didn't record those transition times. I continued climbing with Hayden and Rob for the couple of more summits, completed in a similar time. During the 3rd and 4th climbs, however, first Rob and then Hayden started to slow on the climbs and I grabbed my mp3 player and headed out solo. I continued at that steady pace, making the return trip in 45-50min including the transitions - not fast, but consistent and something I felt I could sustain for the duration. I had to stop for a few minutes after about half a dozen summits to change socks and apply some moleskin on my left heel which was suffering some rubbing due to a shoe that wasn't tight enough. One thing I had forgotten was moleskin, but a friendly volunteer had some that she gratefully let be have. I was also getting a bit of groin chafing from being so ended up changing my shorts to a dry pair. It helped a bit, but still continued to annoy me. Garth Campbell joined me for reps 8 & 9 and it was nice to have company for a bit during the long day. Over 40 people did at least 1 hike throughout the day and there were a couple of other full day participants other than myself. Other the the chafing, things were feeling quite good and I wasn't really suffering much so I knew that my pace had been conservative enough for me to survive the day. After 10 summits though, the downhills started to be uncomfortable. The quad muscles used for braking (required a lot on this mountain) were starting to fatigue out and running downhill started to be hurt. I did some time calculations and figured that I could definitely do 14 summits as long as I didn't totally crack. So with that in mind, I pushed on, knowing exactly what I had to do. I'd been drinking and eating and felt very solid for energy. My times continued to stay fairly consistent although I did slow a minute or two on the descents. On my 12th decent, I went down with Hayden who was finishing his 10th and final summit. He suffered during some of the middle reps, but finished strong and ended up doing more summits than most sane people. At that point, I kind of wished I was finished as well. Even though I knew I could do more, I was getting to the point that I didn't really want to. I saw Chris Calendar a few times near the end as he was volunteering for a couple of hours at the summit. It was a relief to finally be on my last summit. Surprisingly enough, my climbing legs still felt pretty good, and I was able to push the last climb, actually clocking my fastest time of under 21 minutes from the parking lot to the top. Still feeling so strong after so much climbing meant that I probably could have pushed the climbs a little harder and still maintained to the end. I know for sure that if I really wanted to I could actually do 15 more more summits on a dry day, pushing a bit harder on the climbs, and being more efficient on my transitions. Weather I even want to try again is another question...four days out and my legs are still quite sore. Thanks to Andrew and Lisa for organizing this event. Hopefully next year the weather will cooperate. I decided to pop into this race for the 'sole' reason that I was going to be in Kelowna on vacation during this time and therefore thought it was a good opportunity to try something new. Scorched Sole is primarily an ultra event offering both a 50k and 50 Mile option with the 25k and add-on. I was seriously contemplating entering the 50k as my first foray into an ultra distance (also it seemed a good value since the entry fee was the same for all 3 distances). However, coming just 2 weeks before my goal race of the year (qualifying for the Canadian Mountain Running Team), doing the 50k may not have given me sufficient recovery time. The weather on race day was fairly warm (mid twenties), but not brutally hot. Some of my extended family members came to watch me and Sonja (also doing the 25k) start and finish the race which was great. Unfortunately, they also got to witness me make the first possible navigational error of the course! Literally 5 metres in, the race course veered left onto single track. Apparently, this had been announced, but I had missed it and didn't notice the flagging and ran right past it. I heard some shouting behind me, but didn't initially know that it was directed at me, but soon I looked back and noticed my error. I went from first to last place with the newbie mistake which was a bit embarrassing. However, it was a fairly long race so didn't think it would be a big factor in the end. It did take me about 10 minutes to work my way back to the front as passing in some areas was tough and I didn't want to over stain myself this early. I pulled myself up to the leader, Marty Bulcock and we ran together for a little while while the course traveled on the paved road for a little while. We then moved back onto trail for the start of the climb and I soon found myself in the lead. The climbing was moderate and mostly comfortable with a few small breaks here and there. After a few kilometers, I popped out on a logging road. I knew this was coming having studied the map prior to the race and resolved to grind out the rest of the climb (there was over 1100m of elevation gain in total). It was initially quite tough to keep running as the grade was steep and the road fully exposed to the midday sun (the race started at 11am). Fortunately, the grade soon softened a bit and after a while, some clouds rolled in making it more bearable. Based on my previous results from 25k races, I had anticipated to hit the turn-around in this out and back course at the 60-70 min mark (I found out after the race that we actually covered at least 27k which explains some of this misjudgement). As I cranked away and first the 1 hour mark passed and then 1:10, the climbing started to take its toll - I managed to run everything, but barely. Finally, after about 1:20 of climbing, the turn around point with aid station (also shared with the 50k and 50 Mile courses) came to view. With great relief and happily grabbed flat coke, a couple of chips, refilled my water bottle and headed back down. I passed Marty after about 5 minutes so knew I had a solid lead. Third place was held by a woman and less than a minute behind I was happy to see that Sonja was forth overall! The downhill was a nice relief from the climbing, but punishing itself since it was so sustained. I pushed fairly hard, but didn't destroy myself as much as I would have if I was in a tough battle for position. The toughest part was the paved section once back on the road since it contained a few small climbs which the battered legs didn't appreciate. 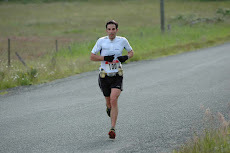 I crossed in 2:13:48, slower than expected (mostly due the increased distance and slightly tougher climb than expected). I was happy to be done and had a nice time hanging out at the beach getting massage and taking a dip in the water which waiting for others to finish. Marty finished about 15 min back. Sonja came close to winning the woman's' division passing Liza Pye on the decent, but didn't have enough left to hold her off on the final road section. Fourth overall is a great result though! I was happy to complete the race, but likely wouldn't do the 25k again on this course as the long road climb wasn't much fun. It was a low key event, but well organized. The announcer had even done research on entrants and know some of everyone's racing bios which was pretty cool. In retrospect, I was happy not to have done the 50k as it turned out to be a tough one with the winner coming in in just under 7 hours (the 50 Mile winner took over 11 hours!). 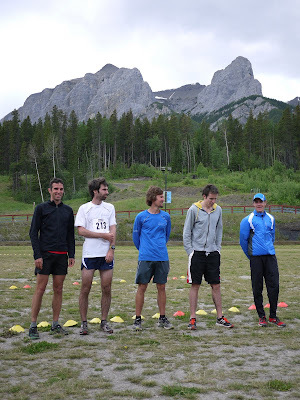 Since the Kusam Klimb was unfortunately cancelled due to snow this year, I decided to jump into a track race instead. Besides the Mile distance, there was also a 400m and a 5000m. I considered trying the 5000m, but I'd actually been having a low energy week and with fatigued legs and didn't think I would be able to perform to to my potential on longer distances. I've never raced the Mile Distance so figured even if I didn't feel great, I could still set a PB! Four laps plus a bit could be survived even if I wasn't feeling my best. I was aiming for a sub 4:40 clocking which meant I'd have to run under 70s laps so I started out at this pace. The legs didn't feel fantastic, but overall the pace felt manageable. I pulled slightly ahead of the next competitors, my training partners, Simon Dejong and Jairus Streight and then concentrated on staying consistent. The second and third lap passed as a similar time and I felt as though I was well in control. Things started to feel tough on the last 400m, but being so close to the finish, I was able to dig in and finish strong in 4:38.5 with a slight negative split. Simon kicked hard on the last 400 pulling back some time on me finishing about 10s back and Jairus another 5s back. All in all, I was happy with the race considering I didn't go in feeling 100%. On an 'A' day, I'm certain that I would be able to pull a few more seconds off. Thanks to Chris Kelsall for his continued dedication to putting on these track events. Here is a quick and long overdo report. Mount Tzouhalem (near Duncan) is the first of 4 Gutbuster races this year and due to other conflicting races and vacations the only one I can compete in this year. I've always found Tzouhalem to be a tough race due to the challenging climb (all the climbing is pretty much done in one steep accent), but I've always raced well here. Since I am really concentrating on hills and as it was to be my only Gutbuster of the year, even more than usual, I wanted to race well. 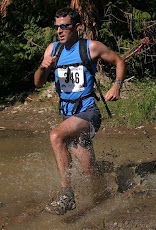 I was racing in a new pair of X-Talon 212 Inov8 shoes that I had recently purchased. They are basically a trail racing flat with massive rubber lugs for traction. To keep weight down, there is no rock plate, however, so I was a little worried that they would really beat my feet up on the steep downhill. This turned out to be somewhat of a legitimate worry, but my feet did survived with only minor damage. My main competition this time around were some regular faces, Shawn Nelson and Sean Chester. To take the win, I knew I had to climb well and build a gap on the ascent as it was likely that both of them would be able to put time into me on the remainder of the course. Thus, I carried through with my plan and started out at a solid pace. Within a km or so the course starts to climb, and first gradually, but soon enough it ramps up. I knew I had a good chance to do well that day when both Sean and Shawn fell back soon after the climb began and within a few more minutes they were out of sight. Now it was time for me to focus and push hard through the pain. About half way up the climb, the course turns onto single track (from double track) and goes very vertical for a hundred metres or so. I have never before been able to run this section as it is just brutal, especially after coming off of a sustained climbing section. This year though, with the legs feeling decent and the lead in hand, I decided to go for it and see if it could be done. It wasn't a fast run and indeed probably only marginally faster than hiking, but I was able master it this time around. While this accomplishment was encouraging, the climbing was not near over and with one more really steep section just before the cross, I had and to gut it out for another 10-15 min of elevation gain. Luckily, the high point came a little before I expected it to so it was a relief to get some downhill on a logging road. Soon though, the course veers back onto a some fun single track. It is mostly fairly flat or downhill, but has a couple little climbs here and there to remind you that your legs are toast. Sonja was not racing, but was running the course and it was around this point that I caught up to her. The course had been altered a bit, with some additional single track added near the far end of the course. The wasn't a long section, but probably added a couple minutes. From this point on the course is primarily downhill with several more kms of nice single track. I was feeling good was pretty optimistic that no one would catch me, but kept the pressure on myself because if someone catches up enough to see the person in front, it gives them extra incentive to push even harder. Before the final major decent, there is a modest climb that can feel tough on the shattered legs. This time around, I was able to hold steady on it, but was relieved to have it over. Then the punishing downhill begins. It is steep and not too technical so extreme speed is possible if your body can take it. I'm not sure that I was quite as fast as some previous years on this section, primarily because my lightweight shoes did not protect me enough from the rocky terrain and I was able to feel a bit too much through the bottom of my shoes. Soon though I was down again and I noticed that a small section of the course had been removed which was just fine with me. Then just a bit of flat terrain, one more little grunt of a hill and a flat few hundred metres to the finish remained. My shoes performed exceptionally well on a little section of mud that racers had to navigate (overall I was quite happy with them despite battering my feet up a bit). I accelerated into the finish stopping the clock at just under the hour mark for 59:52, my best time ever at this venue (although with course changes it is hard to figure out exactly). 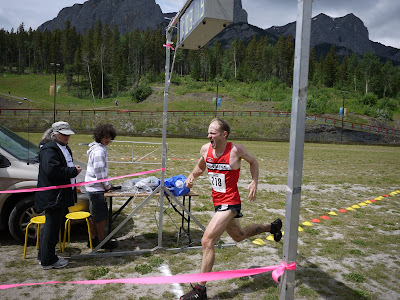 I was pleased with my performance and race execution (and for my first Gutbuster win since 2007) and it shows that I am setting myself up well for mountain running later in the summer. Shawn finished only 40 seconds back so my keeping the pressure up turned out to be a good idea. Sean crashed on course and decided to cruise in after that finishing well back. This left Andrew Pape-Salmon to pick up a podium finish in well run race. Care Wakely continued her dominance of the woman's field with Claire Morgan coming 2nd. I was pleased to see that Antonia Harvey, whom a coach, came in 5th place and only 20 second back from Claire in a cluster of woman vying for podium spots. I expect to see her race well later in the season. To have any hope of keeping this blog up to date, I'd better start writing more and racing less! I'm not sure that is going to happen since it is tough for me to turn down the chance to participate and compete. The Times Colonist (TC) is the largest single race in Victoria and is even tougher than most races to not do because it is so well known even by non-runners. It is a good race due to a fairly fast course and a deep field. There are always plenty of talented racers to run with. This year saw a course change from the last few years from a modified out and back with a turn-around to a pure loop course. Initially, I thought it would be a bit tougher because of the addition of a climb up Johnson St and a few other little blips that did not exist before. However, upon seeing the elevation profiles of both courses, they are actually pretty similar so overall I figured the new course wouldn't make a big difference. The start area is a bit nicer this year than in recent years as it is in front of the Empress where the road is much wider. I expect for people farther back it the pack benefited even more from this extra road space. The 8 am start time came soon enough and off we ran north on Government St. I started to find my pace and the pack quickly spread out. As we turned onto Johnson St off of store St I saw the first km marker. It seemed to come too soon and a quick check at the watch confirmed an impossible 2:32. I don't know how such a large placement mistake happened when even a quick look at the map confirms that the marker should have been another block further along the route. Regardless, I knew it didn't really matter for the overall race. Johnson St is a long gradual climb up, although coming this close to the start of the race it doesn't seem too bad. 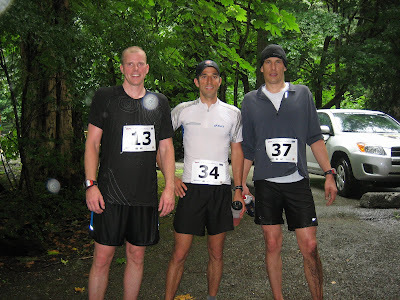 I did, however, start to realize that this race was not going to be as good as Sooke River for me. While I didn't feel too bad, I just didn't feel that I had the same snap in my legs or ability to push myself and hard. There was nothing I could do about it though so I resolved to race smart and see if I could still pull off a decent race. I soon found myself running with local running legend Bruce Deacon. 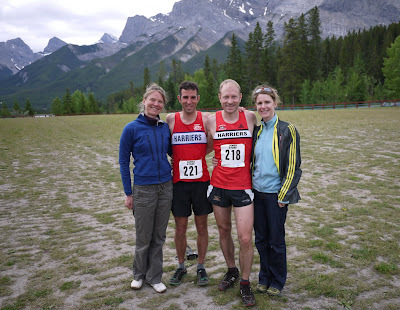 Bruce is a two time Olympian and was Canada's top marathoner for several years in the 1990's. Now a master, he has still held on to most of his speed. Soon we started trading the lead with me gaining on the climbs and Bruce pulling ahead on the descents. We would do this for most of the remainder of the race. As we turned onto May St, we were treated to a little hill and although I expected it, it was still a bit of a bugger. I continued to feel reasonable, if not fantastic and when I went through 5 km in 16:15 I knew I had a very good chance to get under 33 min unless I really blew it on the second half. 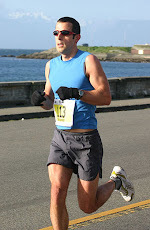 I managed the climb up to Clover Point and Mile Zero fairly well slowing only to 3:21 from 6-7 km. Things started to get a bit rougher for me after that and Bruce pulled a bit ahead of me on the downhill towards Ogden Point. Fortunately, I did manage to keep my pace fairly solid even though it was a little slower than the first 5 km. With about a km to go, Nick Walker went blowing by me, obviously feeling strong. I wanted to latch on and have him help pull me through to the finish, but I just didn't have the ability to change gears at that time. I was just trying my best to not slow down. I managed a weak surge to the finish and closed in a decent 3:14. My final time was 32:43 good for 15th place. Considering that it wasn't my best race in terms of how I felt, I was happy with my time and the personal best. On a good day, I am confident a 32:30 would be possible. I finished1 second behind Bruce, but somehow managed to get placed ahead of him. Perhaps because the official results are sorted by chip time rather than gun time? Nick was a few seconds ahead and Craig Odermatt just ahead of him. Willy Kimsop edged out Simon Witfield for the overall win in 30:22, about 30 sec slower than he was last year so perhaps it is a bit tougher course. The top woman, Karolina Jarzynska from Poland, ran an amazing 32:54 which I believe is a new course record. Congrats to all though who ran, I know many who had some spectacular races on a great day. Since I just ran the Times Colonist (TC) 10k today, it is of course much overdo that I get this race report up. Sooke River is the last of the 8 Island Race Series races. I have not run it since 2007 where I posted a then respectable for me 35:20. The course consists of some rolling hills so it not conducive for blazing fast times, nor is it super slow like Hatley Castle. I had a break of 4 weeks without racing and while I had hoped to really get a solid block of training in, dealing with a new house while also trying to sell my condo sucked up the time. My speed and hill sessions were pretty solid, but I didn't get as many longer runs in as I probably should have, I was hoping this wouldn't hurt me. I didn't have any aspirations that I would be breaking my 10k PB on this race, just figuring that if I could run in the low 33's that would set me up well for doing a sub 33 min at the TC. I went into the race relaxed, but as usual ready to do my best. Off the line, Nick Walker, Shawn Nelson, and myself quickly separated ourselves from the pack. Within a kilometer, Nick fell back slightly undoubtedly opting to run his own smart race. Shawn and I continued to two abreast for another kilometer or so. It sounded as though he was labouring more than he should have been at this point in the race so he must not have been having a good day. I on the other hand was feeling expectationally strong and was running comfortably. When Shawn started to slip backwards a bit, I put the pressure on to get some distance between us. My 3rd km (with a good amount of downhill) was a pretty quick 3:10 although I didn't know at the time how fast I was going since I opted not to look at most of my splits. I had a good lead at this point, but continued to feel really strong. The kind of feeling you get only a couple times a year (if you are lucky) so I wanted to capitalize on it as much as possible. Before the turn around, I only had the company of Garth Campbell, Hugh Trenchard, and one other cyclist who were leading the race. When I am feeling good, I like pushing myself so runnign solo wasn't a big deal. My pace remained fairly consistent to the turn around just before the 5k marker. At this point, it was nice to be able to see the runners in the field behind me. Thanks to all those that acknowledged me even if I couldn't respond in all cases since I was really in the zone. I noticed that Nick had moved into second behind me (perhaps 20s back) with Shawn holding onto third, and Keith Mills nippling at his heels. At the 5k mark, I did look at my watch and was pleased to see a 16:22 split which was better than expected. I knew though that holding on to that sub 33 pace would be really tough on the second half because there was significant hill to climb on the way back. I hit the big hill hard, really hammering up it and getting onto my toes, trying to keep all the speed I could. I did well on the first steeper section, but had to pull back a bit on the final section or risk blowing up. Despite my efforts, this was still my slowest km in 3:31. We were treated to some downhill in the last couple of kilometers which I managed to use fairly well. Things were starting to get more difficult at this point (as they always do) and I was glad the finish was not far away. At 9k, I took a look at my watch and noted that I had 3:05 to get to the finish to dip under 33min...not much time, but I decided to try my best. I pick it up a bit and then after the final corner, sprinted the few hundred metres to the finish...32:30...oh maybe I can make it, I'm so close...32:45...almost there...32:55...in the chute...33:00....damn! not quite. I ended up with a 33:01, but couldn't be disappointed at all since it was better than expected. Picking up a win at an Island Race Series was also a nice surprise and quite honestly not something I was sure was ever going to happen since so many of the races are really stacked with amazing runners. Of course, I do have to thank the Sun Run for sucking all the top talent off the island for that event. Nick held onto 2nd finishing about 30s back and Keith ran well to pull ahead of a fading Shawn Nelson to take 3rd in just over 34 min. Care Wakely took the win for the women, with a minute and a half gap over 2nd place Sara Gross. It was unfortunate that some runners from up island were unable to start with the main race due to a tanker accident at Goldstream. They did get to race in their own heat 30 min later, however. Thanks to Island Road Runners for another successful event and to all the IRS organizers and volunteers - it was a fun season and without every ones dedication to keep things going, it wouldn't happen. Here is a video put together my Chris Kelsall. The footage from Garth's bike it unfortunately pretty far away due to the wide angle on the camera.